The first panel of the second day of the annual IMTFI research conference, "Mobile Money: Consequences for Poverty Alleviation," was as much about mobile carriers' strategies for public rhetoric and practical communication as it was about any possible causal connection between the adoption of mobile money as an individual practice requiring digital and financial literacy and alleviation of systemic poverty in Africa. Kiemo tried to understand the region's low entrepreneurial activity, which researchers initially hypothesized could be cultural. Their subjects were mostly unbanked, but researchers wondered if having new services might foster budgeting, saving, and risk management that would make adoption of MMS more appealing. Using Icek Ajzen's Theory of Planned Behavior, the Kenyan researchers hoped to understand personal attitude, perceived behavior control, and entrepreneurial intention, while also measuring personal finance management that might even include future estate planning. Information in Kiemo's study came from 174 participants, divided approximately equally between agricultural and pastoral respondents. 83.9% were owners of their own mobile money platform, while a significant minority were also users of borrowed phones and/or SIM cards. Researchers found a significant difference in entrepreneurial intention between mobile money service users and non-users: 75% vs. 50%. Yet there was no difference that could be measured between early adopters and later adopters of the technology. The hypothesis that these services also might promote personal finance management was also supported, but the data about mode of livelihood as a factor was more ambiguous. Researchers expected pastoral populations to be more fatalistic and less likely to budget, but those in the pastoral sample actually were active managers of their finances. However, 42% of agriculturalists used mobile money, while only 7.7% of pastoralists did. In fact, 49% of the latter still save with "live assets" (their animals). 90% of the agriculturalists reported entrepreneurial intentions. Researchers found Maslow’s hierarchy of needs useful as an explanatory mechanism of the phenomena that they observed. Ndunge Kiiti and Jane Mutinda followed with a study focusing on Eastern Kenya and the use of M-PESA. Rather than only focusing on high-level strategies of corporate brand penetration, in "Mobile Money Services and Poverty Reduction: A Study of 21 Women's Groups in the Rural Region of Eastern Kenya" examined self-help groups as well, such as the Strength of Women (VWAG) in which the researchers were also members. M-PESA has tried to capitalize on the forms of person-to-person education practiced by those groups. 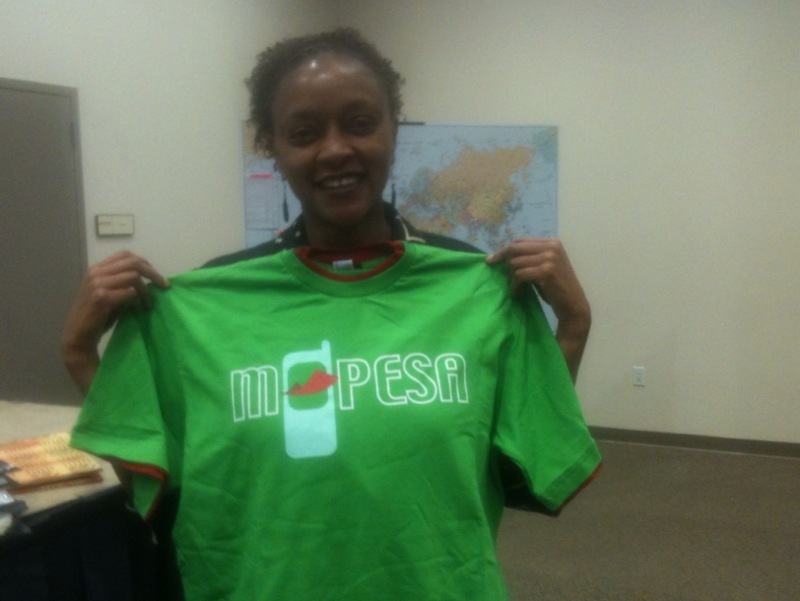 In the image above Kiiti holds up the M-PESA t-shirt that she draped on the podium during the panel. Kiiti cited the saying that "a human becomes a human because of other humans" to characterize the researcher's framework, which moved step-by-step from a focus on "individual" to "family" to "community" to "nation" with an emphasis on training and workshops. Their data was gathered from 21 women’s groups where, following the dictates of Paulo Freire, everyone is a learner, and everyone learns from each other. Researchers did field work that included site visits to the groups' social settings, where they conducted multiple in-depth interviews with individuals and five focus groups. They also performed observations of user behaviors with M-PESA. Clearly, Kiiti argued, the service caters to groups without banking and builds on the existing urban-rural linkages that were described by Mas & Morawczynski. The panel's final presentation on "Does Mobile Money Matter? Exploring Mobile Money Adoption by Ghana’s Urban Poor" from Vivian Dzokoto and Edwin Mensah repeatedly made the point that "Ghana is not Kenya." In 2008, apparently, mobile money services were introduced, but "nothing happened." Even after 2010, when four telephone companies were in the market, Dzokoto described the main feature of the Ghanaian "moneyscape" as resistance to new money products. Even debit cards were slow to be taken up in a country where only traditional ATM cards had been successful. Researchers chose "awareness," "attitudes," "uptake," "barriers," and the "impact" of mobile money as the focuse of their year-long study of mobile money post-(re)launch, which focused on 35 low-income Ghanaians and 35 non-poor lower middle class income Ghanaians, as well as a review of documents that included magazine advertisements and brochures, along with location scouting for billboards and mobile money advertisements. Companies like AIRTEL may have two million mobile phone subscribers, but only 1% of their customers were registered for mobile money, and such corporations offered hands-0n workshops for journalists, like one held in November of 2011, rather than one-to-one education aimed at users. In the case of TIGO, which had designed a post-launch marketing campaign, the carrier had done relatively better, particularly by differentiating between table top phone credit vendors and mobile money agents to promote trust. As they closed with images of Accra Mall or buildings on Oxford Street, Mensah reminded the audience that "In Ghana, cash is still king." Moderator Maria Stephens of the U.S. Agency for International Development (USAID), and noted mobile money skeptic reminded the audience that not every country would have the same kind of experience that Kenya had had with M-PESA. She pointed out that just as Nixon argued that democracy is not a potted plant that can be transplanted into any soil, it was important to not fall into the we-build-it-they-will-come trap. Stephens also differentiated between "promoting a low-value low-functionality money transfer service" that functioned in an income-smoothing context or "a high-value unlimited functionality model" tied to broader financial services not subjected to banking laws that could unintentionally allow a parallel shadow banking system to flourish.